I’m always looking for a kid friendly recipe to make when Will & Nicole are here. This definitely fits the bill. I adapted this recipe a bit because Nicole has a shellfish allergy so I couldn’t use oyster sauce. I also doubled the recipe to feed my starving tween stepson and I wanted leftovers. The recipe below reflects the changes & the doubling. Chop all your veggies first because this recipe comes together pretty fast. Mix together the soy sauce, peanut sauce, hoisin sauce and sesame oil in a small bowl. Set aside. Heat a large skillet or stirfry pan over medium high heat. Add oil. Add the onions and cook until they begin to soften. Add garlic and ginger. Cook for a minute to heat it up. Add the ground turkey. Cook until the turkey is done. Add the bell pepper and water chestnuts. Cook for a couple of minutes and then add the white wine. Cook for another minute and then add the sauce. Stir and reduce for 3 or four minutes so sauce will thicken. 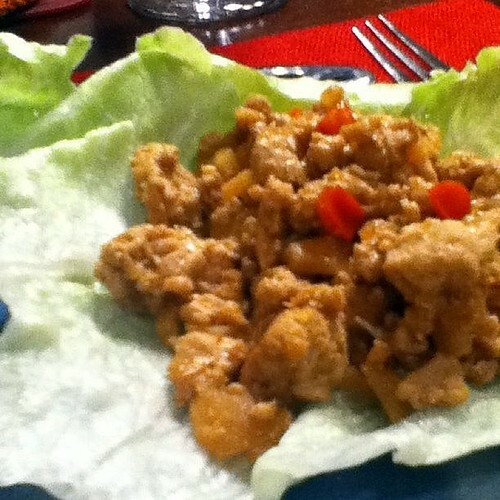 Serve on the iceberg leaves with peanut sauce on the side. Recipe Notes: Everyone LOVED these. The iceberg lettuce breaks a bit easy. I think I will use butter lettuce next time as it is a bit more structurally stable.